Interview with BijaRi in São Paulo, Brazil. Virginia Gil Araujo interviews Grupo BijaRi in Sí¤o Paulo. May 2007. Virginia Gil Araujo: We know that BijaRi is a collective with an urban studies background. How do actions in urban space promote the use and function of architecture and situate the meaning of a city? BijaRi: First of all, we believe it's important to talk about the reasons behind the pressing need to think about architecture, urbanism, and cities in terms of the political and ideological connotations they carry so as to see how we can channel those reflections into contemporary art. The metropolis of Sí¤o Paulo, with 20 million inhabitants and all the diversity, complexity and contradictions that such a city implies, has always been a great challenge to BijaRi. Since Sí¤o Paulo is extremely rich and poor at the same time, it has all the problems that characterize today's large cities, on an immense and highly explosive scale. On the one hand, there's the pollution caused by automobiles through emissions of noxious gases, and on the other the stupefaction caused by groups who are marginalized and live in places that are unfit for urbanization -rivers, streams, basins-and without the barest sanitary infrastructure. High levels of violence stemming not just from class differences, but also from ethnic differences due to recent tensions: marginalized groups vs. the police, urban social movements (labor and housing) vs. the government. Exclusion and marginalization on the one hand, and on the other promotion of a wealthy, globalized image in which credence is given to the myth of professional success at all costs, the culture of celebrity and obscene ostentation. All these ingredients make up the explosive cauldron that is the culture of Sí¤o Paulo. Having witnessed that and stated those conflicts explicitly, BijaRi first sought ways of taking a critical and innovative stance on urban issues through actions that in principle have no bearing on formal art. We sought to counter the media, create dissident images and provocative actions by using the urban landscape as a context. It was always the collective's intention to be in contact with the street, with new constructions, with walls, border zones, classless inhabitants and people in general. Little by little the art sphere naturally appropriated such creations, where everything is appropriated with revised meaning and ethical values. VGA: Could you comment on the urban action called Galinha: elemento analizador (Chicken:analizing element) (2002), one of the group's initial works? BijaRi: Well, the group has two seminal works. The first is an action featuring a chicken and focuses directly on urban bio-political issues. We planned it following research into antagonistic socio-cultural contexts. The purpose of the action was to engage and dialogue with the public in a different way via this unprecedented situation: a chicken let loose in two of Sí¤o Paulo's most frequented spaces, each with very different characteristics. The first, Largo da Batata, part transportation terminal and part informal market, is a space frequented by the poorest population groups, predominantly made up of communities from north-eastern Brazil, the majority of which is black or of mixed blood. Next to that is the Iguatemí­ shopping mall, the city's most exclusive, wealthy "supermarket", frequented by celebrities. It's important to point out that both are on the city's western side and on the same street, Av. Faria Lima. We let a chicken loose in both places, and started filming people's reactions to the situation we had created. 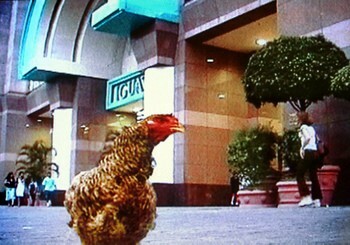 Whereas the low-income space was characterized by a series of symbiotic, corporal, verbal reactions involving entropy and rapprochement, the reaction in the exclusive domain of the shopping mall was typically that of control; the chicken was treated as an "intractable element" and with a "suspicious attitude" (a police term used to justify the indiscriminate harassment of suspects). The chicken in the shopping center was first isolated and then removed from the premises by the supermarket's private security forces. The juxtaposed situations were filmed to document the forms and structures, both visible and hidden, of social and spatial control. They also served to question certain urban-centered notions regarding the vitality of public space, notions that often address the process of urban reordering on the basis of exclusion. Largo da Batata for instance is now living through advanced stages of gentrification. On the Iguatemí­ shopping, with its broad granite walkway, exotic palms, well-lit shop windows and surveillance cameras, both the bodies and the minds of the people walking by turned stiff: stunned and thrown off guard emotionally, they reacted negatively, reflecting a view of the world in which a chicken is seen as a threat. On the other side of Faria Lima Ave., chickens are a pretty popular and a highly appreciated source of food, and the reactions to the action were entropy, rapprochement, and playfulness, bearing witness to a genuinely collective quality that wasn't anybody's in particular, thus making it everyone's. The other (seminal work) is the afiche anti-pop (2002) (Anti-pop poster), consisting of a star crossed through the middle like in No Parking signs painted in basic silkscreen), which we put up in the streets of Sí¤o Paulo during a recent celebrity-cult boom in Brazil. We then asked ourselves: aren't you just creating another icon for the very thing you're criticizing? We realized that the way to intervene was to look towards a similar symbolic plane, the plane of information, of show business, and subvert its content. When we were invited to the Havana Biennial in 2003 we put up those posters and that had an interesting effect due to the confusion it caused since in Cuba a star is the symbol of the revolution.